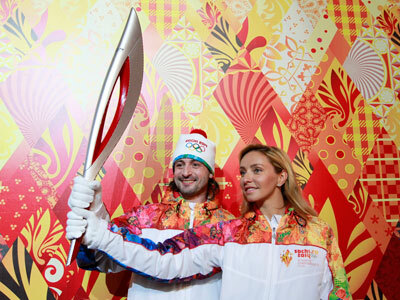 Russia’s Olympic Committee has presented the Olympic Torch, one of the central elements of the upcoming Sochi-2014 XXII Winter Olympics. Inspired by Russian fairytale Firebird, it will make a journey like no other Games torch before it. 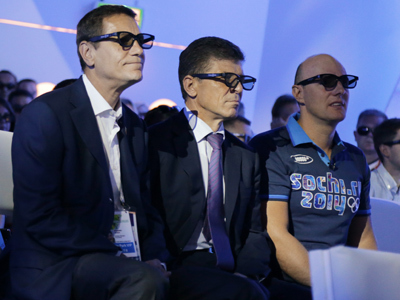 ­The presentation ceremony that took place on Monday in Moscow’s GUM trade center facing Red Square was attended by a large number of Russian renowned athletes, celebrities and sports officials. Like the city of Sochi itself, a popular subtropical seaside surrounded by snowy mountaintops, the Olympic torch looks like fire and ice combined, realized in silver and red colors and resembling a feather of the Firebird immortalized in Igor Stravinsky’s eponymous ballet. The torch for the Paralympic Winter Games is represented in silver and blue. According to the fairytale, the one who obtains the Firebird’s feather gets good luck in its purest form and this is exactly that has been inspiring the creators of the torch, visual designer Vladimir Pirozhkov and technical designer Andrey Vodyanik. 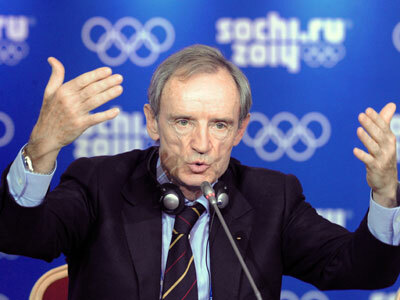 The Olympic Torch Relay will start on October 7, 2013. 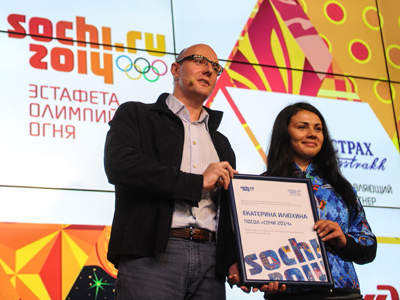 Before the Olympic Flame reaches the cauldron of the stadium in Sochi, it will spend 100 days traveling through 2,900 Russian cities and settlements. The torch will travel 65,000km with the help of over 14,000 torchbearers. 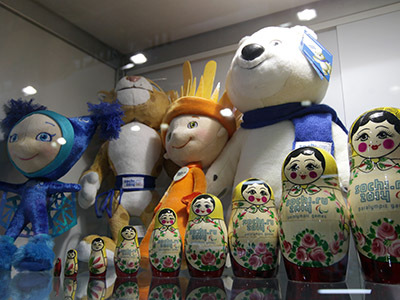 Russia’s Olympic Committee has promised that up to 90 per cent of the citizens of the Russian Federation will be in “one step” proximity to the Olympic run. The Olympic Flame will visit the North Pole, the bottom of the world’s biggest reserve of fresh water, Lake Baikal, get on top of Europe’s highest mountain, Mt. 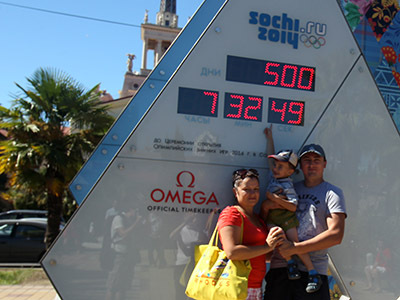 Elbrus (5,642 meters) in Russia’s North Caucasus, and there is even a chance that the flame will go – surprise-surprise! – into space on the International Space Station, where cosmonauts will take it with them for a spacewalk. 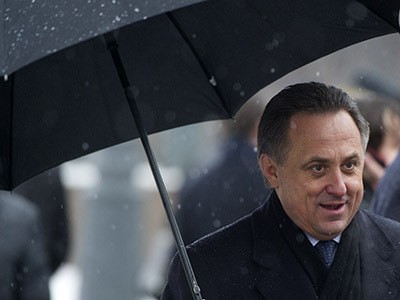 The torch has not only been designed to arrest the gaze of the Russian public. It is a technically-advanced heavy-duty device meant to keep the Olympic Flame safe in various environments while being carried by thousands of people with different physical abilities. Despite being nearly one meter (95 centimeters) long, the torch weighs only 1.5kg due to the use of aluminum and special polymers. Engineers say the burner section of the torch has been specifically designed to produce a previously-unseen massive orange-red flame. Also, the gravity center of the torch has been moved to the lower part of the device to facilitate carrying and prevent the torch from being wrenched from the hand of a torchbearer by wind gusts. The device uses ecologically friendly natural propane gas to produce a stable large flame in all weather conditions from -40 to +50 Celsius. Naturally, an ISS spacewalk, the Baikal Lake dive and the Elbrus conquest will imply more sophisticated devices to be used. Overall 14,000 silver-and-red and more than 1,000 silver-and-blue torches will be manufactured and each torchbearer will keep his or her torch as a souvenir.